For a company whose foremost mission has been to transcend language and cultural barriers to bring smiles and surprises to players worldwide, Super Mario Maker becomes the perfect embodiment of such an admirable goal. Everyone has come to treasure their own memories with Nintendo’s portly Italian plumber over the years, whether that be saving Dinosaur Land from Bowser’s clutches, mindlessly chasing a bunny around the basement in Peach’s Castle, or soaring through space with the moustachioed hero. But this new Wii U exclusive presents a unique proposition in allowing players to craft their own challenges for Mario to conquer. The overwhelming reception that Super Mario Maker received at the Nintendo World Championships was clearly a positive indication of the experience to come, but the present that Nintendo has gifted their most recognisable creation for his 30th birthday is unquestionably remarkable. And, it can easily be said that Super Mario Maker amounts to a more fitting celebration than the underwhelming Super Mario All-Stars 25th Anniversary Edition. Here, Nintendo once again delves into the ‘Play,Create, Share’ genre coined by Sony, although a concept within which they have previously dabbled with WarioWare: D.I.Y., Pullblox, and the Mario vs. Donkey Kong series. The result this time around is their most comprehensive approach to tackling a game that will soon rely on community content to drive interest moving forward. That sees Super Mario Maker inevitably deliver separate experiences, welcoming those more creatively inclined to design their own dastardly courses as well as those with less confidence in such skills by simply allowing them to enjoy playing submitted creations. That being said, Nintendo still looks to help spark that creative desire from the start. An opening tutorial places players in an incomplete World 1-1, tasking you with filling in the blanks with missing items and enemies. This gentle nurturing is reflected in the way that course elements are steadily introduced to the player in separate truckloads over consecutive days, as long as you spend enough time in the ‘Create’ mode the day before. That steady stream risks frustrating those that want access to everything at once but is a more considered approach to allow those with less experience to have time to play around with new elements as they are unlocked. It certainly makes creation feel far less daunting and matches up with the design philosophy that some of the most brilliant Super Mario courses often only consist of a handful of elements remixed into a memorable challenge. 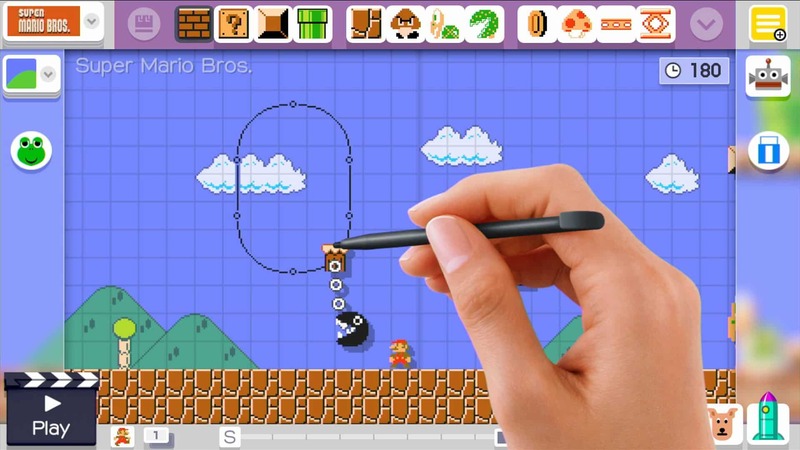 We can be thankful that Super Mario Maker‘s creation interface is remarkably intuitive, hiding away numerous easter eggs – with clear, humorous nods toward Mario Paint. Heavily reliant on using the Wii U GamePad’s touchscreen, stylus-based control allow for instant editing as you play around with any ideas that strike which don’t necessarily have to be particularly traditional. Usable elements are listed across the top of the screen, while players are free to design courses in Super Mario Bros., Super Mario Bros. 3, Super Mario World and New Super Mario Bros. U visual styles. This not only represents the Italian’s 30-year journey from NES through to the HD era on Wii U but sees each style also incorporate mechanics that were introduced in each selected game. It’s an incredibly well-brewed melting pot, and Nintendo’s staff have clearly poured a lot of love and attention into helping encourage players to spend as much time experimenting as they do playing through courses. Even with the now limitless design, Nintendo have seemingly thought of every possibility whether that be Goombas swimming underwater or Cheep Cheeps leaping aflame in lava. Nintendo has allowed a remarkable amount of creative freedom, with course creators able to choose between auto-scroll and time limit options, or even recording your own sound effects. But, more significantly, wackier ideas can take Mario outside of what is expected and into the realms of frequent surprise. Super Mario Maker‘s accompanying book expertly helps inspire players with more outlandish designs, with codes that be inputted through the in-game manual unlocking helpful videos that talk through design processes. So, a blank canvas can soon be turned into even the simplest of experimental ideas, and from there can hopefully lead you toward completing an entire course of your own. 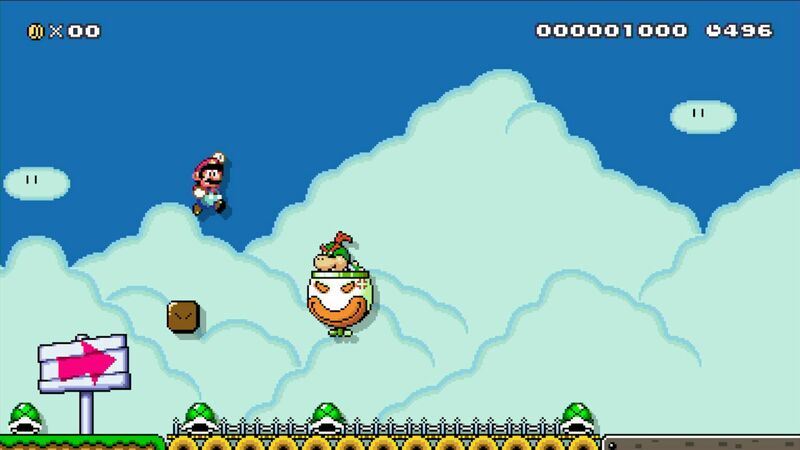 Beyond submitting your creation to the world, much of your time will be spent within Super Mario Maker‘s ‘Play’ portion. Here you can take on the 10 Mario Challenge, where players can take on eight courses designed by Nintendo with only 10 lives to rely on. But, the real time sink comes in exploring Course World, where Nintendo introduces the 100 Mario Challenge alongside options to search for particular courses and makers. Discoverability is key with community-led content, and the 100 Mario Challenge is a concerted effort to help you stumble on particularly great and potentially not-so-great courses. That variance applies to critics, and while I have played some tremendous courses over the past few weeks I have also been subjected to far weaker efforts. Completing a course allows you to rate it, rewarding the creator with Stars that will not only encourage them but work toward lifting a restriction on the number of courses that they can upload. Hopefully, this will help to promote those that are taking the time to create and publish worthwhile courses, allowing more lamentable experiences to drift to the back of the pile. Whereas categorising will help you filter by difficulty, region or when the course was uploaded, with creators able to share a code that will allow players to more directly discover their creations. amiibo support is already well documented but allows players to unlock Mario Costumes that act as power-ups once a Mystery Mushroom is collected. These can be placed in your own courses to be shared online and are otherwise unlocked through normal gameplay, but it’s a shame that their implementation is restricted to the 8-bit Super Mario Bros. graphical style. However, the integration is welcome and it’s great to see Nintendo recreate so many of their characters with such retro aesthetic. Super Mario Maker delights in the unexpected, Nintendo’s desire to surprise now being passed on to aspiring creators who are left alone to unleash their own creativity on the Mushroom Kingdom. It’s another success for the Wii U GamePad, and with an expansive and yet intuitive toolset I’m particularly looking forward to seeing what creations emerge over the coming months and years.